BC Sports is a card/memorabilia chain store that is located through the East Coast, primarily in the Northeast. Sadly, like many card shop, the cards are overpriced, often times grossly overpriced. That hasn't stopped me from shopping there. Sometimes -- sometimes -- you can catch some deals. Perhaps a couple of older boxes get marked down. But it always has the newest items from Topps Series 1 to Upper Deck Premier. BC Sports offers a club and not just for kids. With your BC Sports card, you get 10 percent off boxes and they track the amount of money you spend because at the end of the year you can use points to purchase memorabilia. For every 250 you spend on cards in the store (this includes loose packs), you get $25 off at the end of the year. I've actually never used my points at the end of year, which is dumb. If I am spending the money, I might as well reap the small benefit I get of spending money in this store. This year I had $100 to use (yeah, that's $1,000 I spent in the store in 2008). This year, BC had a huge sale on its memorabilia right around the time you are supposed to use the girt certificates. As I looked through the store, this one based in the Philadelphia region, there was mostly Phillies products such as a Cole Hamels auto'ed World Series baseball or a Chase Utley auto'ed All-Star game baseball. I considered both, but I had my eye on something else. The guy behind the counter (who knows my name, my job, my boyfriend and his collections -- clearly I spent too much time in this place) said, "You can get that kind of stuff anywhere." He was right and I caved. I said, "Get it." With the discount and my gift certificate, I spent about $150 on this item and I'm thrilled. Mariano Rivera, a nine-time all star, is one of my favorite Yankees. There have been so many great moments in recent Yankee history that he has been apart, it's difficult not to like this man. He always has a smile on his face. He's a giving and generous person. He's a heck of a competitor. Rivera is 40 and still at the top of his game. While watching him, you can't help but wonder how a man who weights 140 pounds soaking wet can rear back and throw the way he does. Even in his worst moments -- 1997 against Cleveland (I hate you Sandy Alomar) and 2004 ALCS against the Red Sox (I blame Tom Gordon more) -- he is still great and the embodiment of class. I haven't figured out where this is going to go yet, but I'm sure it will go in the crazy room (That's what we call the office, which houses all of my baseball cards). That's a beautiful piece. I used to practically live in a BC Sports store in Jersey. It was probably good that I moved. I had about the same amount of "memorabilia dollars" as you did before spending them on Devils stuff. 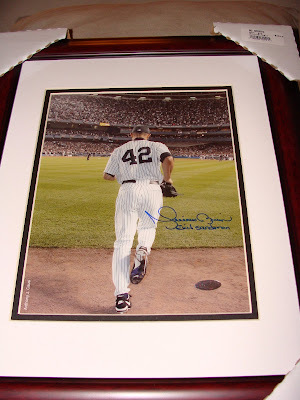 That's an amazing picture and I love the "Exit Sandman" inscription. When we went up to Yankee Stadium in July and Mo came in, the entire Stadium stood up. It was an electricity like non-other I've ever witnessed. That's a cool-looking piece. So was that $150 AFTER the points, or before? That's an awesome addition; Mo is a one-in-a-million pitcher, and a quality guy to boot - he signed a card for me at the Metrodome, God bless him! When I went to NY this summer, we never got to hear "Enter Sandman" play in the Bronx, but I stood up and booed as Billy Wagner entered to it at Shea. It's a surprise I didn't get sent back to Minnesota in a bag. Anytime someone is giving me free credit for stuff, I'm gonna use it. I used mine last year for something I will reveal later, and I am waiting for this years to come since I had to order it. This was much cooler than a Chase Utley or Cole Hamels ball will ever be. Great addition to your collection! Mariano has one of the sweetest sigs I've ever seen. That is great, except doesn't he realize that the song is "Enter Sandman"? I am not sure if that's a serious question or not. 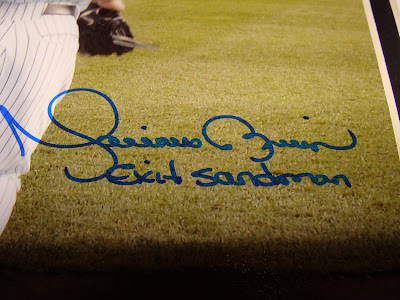 In case it is -- It says Exit Sandman because it was taken at the last game at Yankee Stadium. You can see the bunting around the stadium. Therefore, Exit Sandman for the last time. I gotcha. Yes, it was serious. LOL ... My $100 gift certificate meant I spent $1,000 in that store last year. (nevermind eBay). I feel like I bled for this thing.